當晚提供的三十年陳酒款, 是 2010 年開始推出的版本, 由 Oloroso Sherry 雪莉桶陳和 Bourbon 波本桶陳的原酒調配而成. 無論從陳年和價格上來看, 這款酒是屬於高等級別. 高等級別….那, 酒質呢? 一喝便知龍與鳳, 喝吧! 結論: 氣味爽淨, 起初淡薄, 但放久了變得豐富, 甚佳的複雜度, 菸草和皮革賦予年月的感覺, 此外, 氣味是越來越甜的. 中等酒體, 柔軟, 沒有氣味上的甜但較焦香, 亦多了香料的味道. 輕軟舒適的餘蘊. 一款複雜有層次的酒, 豐富, 柔順,雖則對我等粗人來說是過於柔和, 但整體來說這是一款好酒. 這款酒需要時間等待, 靜侯她卸妝後展現的原本美態. 對了, 這款酒以酒質來說, 也是屬於高等級別的. Glenfiddich 30 years old is belonging to the Rare and Vintage series of Glenfiddich. The bottling I now introduced is the new version which was firstly released in 2010, blended from whiskies aged in Oloroso Sherry and Bourbon casks. 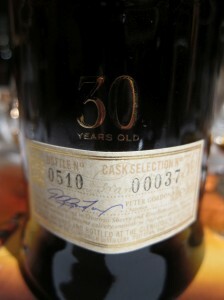 It is a premium class of whisky, in terms of its age and price. Premium class….how about the quality? Let’s drink! Conclusion: Clean note, weak and light at beginning, getting rich over time, good complexity, tobacco and leather impress old age feeling, yes, getting sweet over time, too. Medium body, soft, lesser sweet but roast, spicy. Soft and comfortable aftertaste. Complex and layered, rich and soft, though too soft to me, very good overall. It needs time for her to undress and worthy to wait for revealing her beauty. 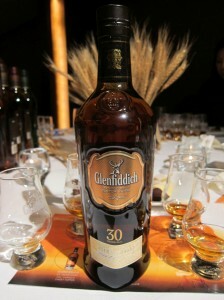 Yes, it is a premium whisky in terms of quality as well.